Our transportation services include planning, designing, and administering construction of local streets and rural highways, major urban arterials, U.S. and state highways, tollways, and the interstate system. Services on these projects have involved traffic analysis and modeling, public involvement, alternative development, safety analyses, environmental assessments of documentation, structures, pavements, utilities, lighting, traffic signals, stormwater management, and green initiative systems. Our staff has the expertise to provide quality plans and specifications, design reports, environmental assessments, and special studies that state and federal procedures require. 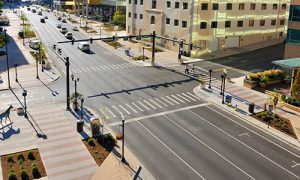 Our expertise covers the full spectrum of elements included in today’s more complex transportation projects, such as feasibility studies, environmental assessments and impact statements, traffic analyses, public outreach programs, and right-of-way planning and acquisition, agency coordination, construction engineering and administration, and overall project management. • We have the knowledge of local, state, and federal transportation regulations and are familiar with the corresponding agencies to maintain cooperation and coordination to complete projects on-time and cost effectively. • Our staff includes experts in all phases of traffic planning, road and bridge design, and construction management. Contact us for more information about our Transportation Services.